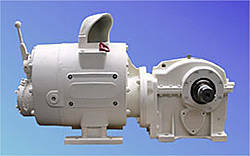 Düsterloh pneumatic motors have been designed for permanent operation and rough operating conditions. They also work reliably in a humid atmosphere and under extreme climatic conditions. The motors can be operated using air, nitrogen or other gases. As standard, they are equipped with protective strainer seals, differential pressure oilers and adjustable rev limiters. Special versions for operation with unoiled air are available. Good sound absorption is guaranteed by long exhaust gas routing, additional downstream sound absorbers can also be delivered. Hardened and ground rotors ensure a long service life.